When is ‘too late’ to assess stubble for blackleg? 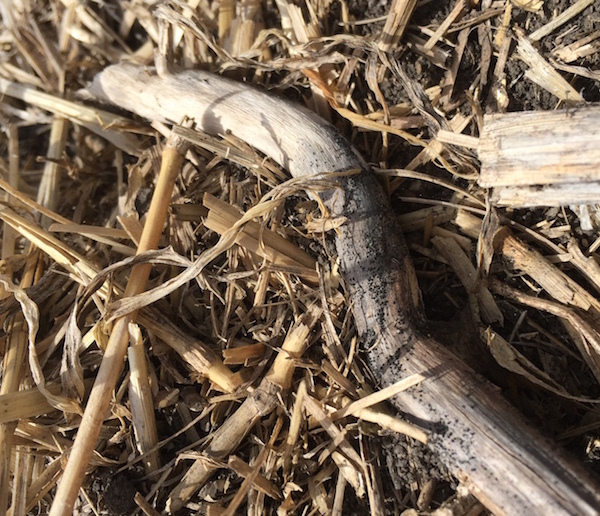 Field observations suggest that blackleg may be increasing in some areas. Official disease survey results for 2018 will be announced at Western Forum October 17-19. In the meantime, farmers and agronomist may still have time to count the percentage of plants that are diseased. This is likely blackleg but also other saprophytes that set in later in the season. For that reason, cut stems are not a reliable indicator of blackleg severity. The scouting protocol for blackleg disease is to clip stems while seed colour change (SCC) is occurring on pods from the main stem. At this earlier stage, one can accurately assess the percentage of plants infected (incidence) AND the severity of infection. In the weeks after that stage, disease will continue to amplify. 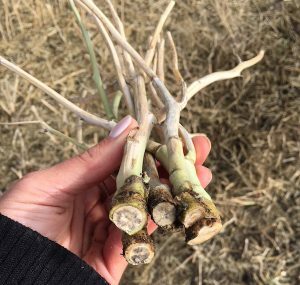 Scouting at combining is likely too late to accurately assess how blackleg severity influenced yield, and by that time other saprophytic organisms may have invaded the dried stems. What you can do just before combining is clip 25 plants to see how many have blackleg. (Multiply by 4 to get percentage.) If the incidence is over 30%, or if it has increased from the previous canola crop, this indicates that the genetics used are not working effectively. Gather stem pieces. You can also check the amount of blackleg pseudothecia on several dozen canola stem pieces in fields that will go into canola next year. These spore-carrying stem pieces left over from the last time canola went on the field can last 2-3 years and provide a clue to the extent of viable blackleg spores in the field. Pseudothecia look like tiny dirt pieces that don’t easily rub off. In a “normal” field with previously low levels of blackleg, very few pseudothecia will be found. In a field at higher risk for blackleg, half (or so) of these pieces will have 50-100 dots of pseudothecia on each. Scouting for these old, infected stubble pieces can be done in the spring as well, but by then seed is already bought. 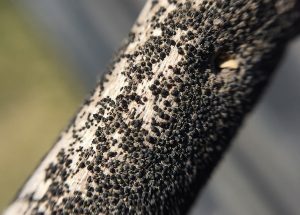 Any infected residue in the fall or spring can be used for the blackleg race ID test to help determine what the predominant race is within a field and to help make variety decisions. 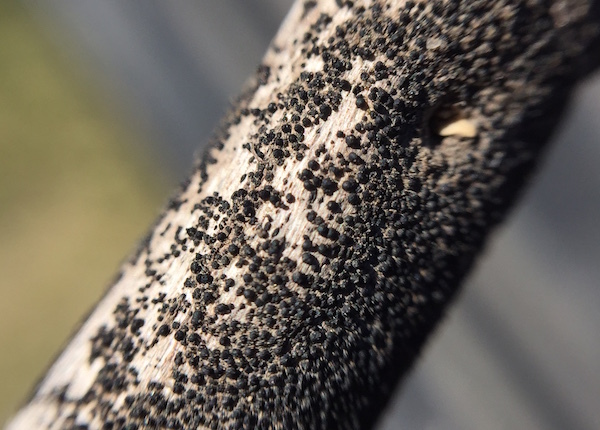 Blackleg pseudothecia on old canola stem pieces.